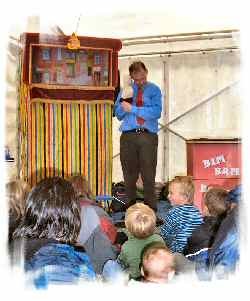 Mr. Bimbamboozle has appeared at Chirk Castle and Erddig on occasion, but takes greatest delight in his many appearances at the two local properties, Plas Newydd on the Isle of Anglesey and Penrhyn Castle near Bangor. Plas Newydd, the home of the Marquess of Anglesey, houses the stunning Rex Whistler mural in the dining room. 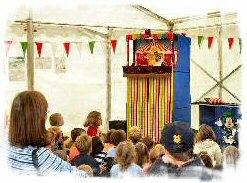 In a spectacular riverside setting are held occasional children's Fun Days where Chris's Punch & Judy and Magic are usually a feature. Set on the wonderful sloping lawns these events have all the gentle charm of a Country House Garden Party of yesteryear. 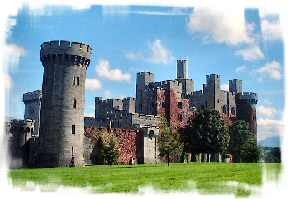 Penrhyn Castle, an extravagant piece of 19th Century neo-Norman architecture, decorated with intricate carvings, stained glass and handmade wallpapers, boasting a staircase so grand that it took 10 years to build, houses one of the best art collections in Wales. The castle is surrounded by acres of parkland and wooded walks with beautiful plants. 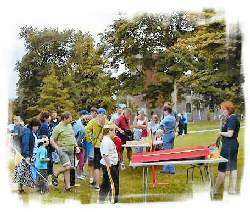 Penrhyn's magnificent grounds form an ideal setting for the themed Children's Fun Days which are weekly events throughout the summer holidays. Mr. Bimbamboozle is an important ingredient at each of these, usually presenting two different shows during the afternoon. Chris also usually appears at Penrhyn for one day during the Easter, Whitsun and October half-term holidays. 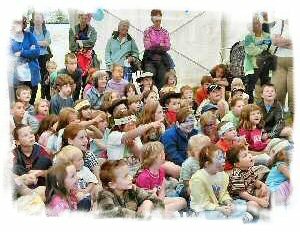 Fun Days at both Plas Newydd and Penrhyn Castle are quite wonderful events for families with games and craft activities, quizzes and treasure trails, and wonderful entertainment. Glorious weather often enhances these events, but marquee shelter is always there in the event of a shower.